When you have a complete web marketing keyword list organized by ad groups and match types, you can segment the list even further. This situation applies if you want to drive visitors to a specific product or place, but starting a separate ad group doesn’t make sense. Some of the keywords indicate specific colors for rose wedding invitations: red and pink. Rather than drop visitors off the product page for rose wedding invitations, you can take them one click further by using a keyword destination URL for each color. Select the URL for the product page of the pink rose wedding invitation, for example, and direct visitors there specifically for the keywords pink rose wedding invitation and pink rose wedding invites.This strategy works especially well if you have only one type of product but still want to have the keyword so that when someone does search on it, your ad appears. 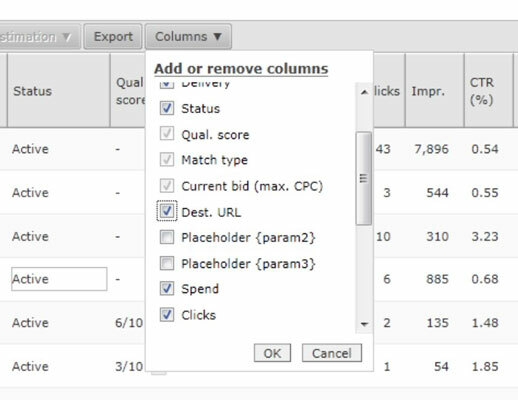 Google: You have to use the offline AdWords Desktop Editor or go through an export and import of an Excel spreadsheet using the AdWords template. The desktop editor is a free download from Google AdWords and is the easier choice. Log in to your adCenter account and click the ad group’s name to open the ad group. Click the Keywords tab to open the entire keyword list for that ad group. Click the Columns button in the navigation area and select the Dest. URL check box. Then click OK. The Destination URL field now is visible. Click the keyword(s) that you want to add a keyword-level destination URL to. Enter the URL and click the Save button.